The importance of hip mobility has been touched on earlier and our previous blog gave insightful information regarding hip muscle symmetry and the need for adequate gluteal strength. So how can we truly maximize gluteal activation to maintain a stable and optimally functioning hip joint? We are all aware of the importance of stable shoulders when pressing over head, however, we often neglect the hip joint stabilizers with the hip being a pivotal link in the chain for running, squatting, dead lifting, Olympic lifting, jumping, and the list goes on. The human body is made up of two muscular systems; local and global. Local muscles are important for joint stability by acting close to the joint axis while providing predominantly joint compression rather than torque. Global muscles on the other hand are more superficial and generate greater torque. Research has shown that specific isolated local muscle retraining is more effective in stabilizing joints than global muscle bracing, whereas non-specific training involving local and global muscles resulted in a delay of local muscle activation. We often refer to the local hip stabilisers as the ‘hip rotator cuff’. This cuff consists of deep hip external rotators including quadratus femoris, obturator exturnus and gemelli along with the internal rotator gluteus minimus. All of these sit deep underneath gluteus maximus and medius. Recent studies have demonstrated that pre-activation of these hip rotators can improve efficiency of contraction of the global muscles and can improve limb alignment and power generation. This means incorporating the exercises below in your warm up will allow you to squat bigger, jump higher and run further. These muscles are important not only for hip stability or maximizing contraction of global muscles, but also keeping your leg in an ideal alignment. You hear coaches constantly telling athletes to ‘keep you knees out’ when squatting. A lack of activation or control of the hip rotator cuff can cause the femur to internally rotate during hip flexion whilst under load such as in squatting movements. This excessive internal rotation of the femur places the gluteals in a less than optimal length/tension position whilst causing a valgus force through the knees (knees moving inwards). This inward displacement of the knees places excessive and unevenly distributed loads through the knee compartments, which can then create knee issues down the track. An easy way to quickly screen for poor hip cuff activation is to perform a single leg quarter squat. During this movement, we want to look for control and smoothness of movement, knee position as described above, glut activation and any differences between the right and left hips/knees. So how can we easily and quickly optimise our hip rotator cuff activation? This movement will emphasise resistance against internal rotation and adduction through full range of movement and will activate your hip rotator cuff like lightning to a cold spoon. Do 4-5 sets of 10 reps incorporated into your warm up to have yourself primed for a heavy lift, pump session or run. 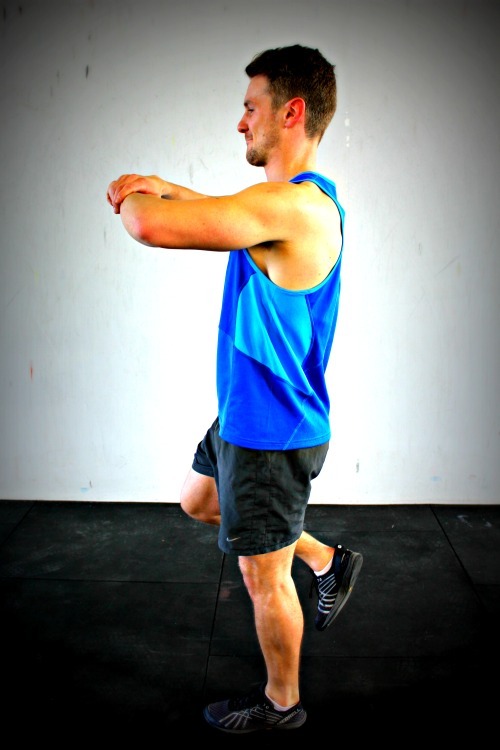 Adding these exercises to your warm up routine will see better local and global muscle activation, ideal limb alignment, improvement in performance optimization and help reduce the risk of injury.